The Church has come out in support of the residents of several villages across the State expressing its solidarity with villagers who are objecting to bringing their villages under the purview of various state-run Planning and Development Authorities (PDAs). Urging the government to scrap PDAs and ODPs, the Church body, Council for Social Justice (CSJP) stated that the government had encouraged local bodies to prepare their own Gram Panchayat Development Plans (GPDP) as per the Fourteenth Finance Commission’s criteria. But the government is imposing PDAs and preparing ODPS, which is a fraud on the people, for the same villages, ignoring the GPDP approved by the gram sabhas. 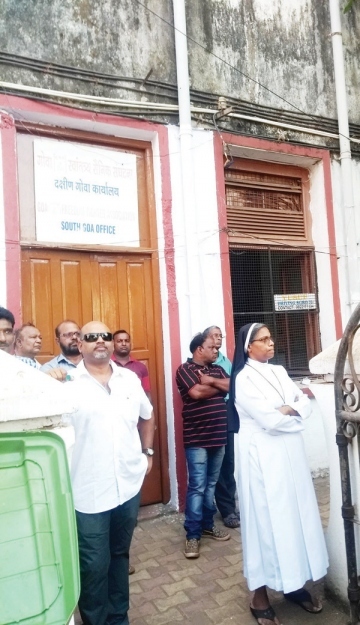 “The CSJP appeals to the state government to immediately scrap the PDAs and re-enact the Goa Town and Country Planning Act in order to incorporate the District Development Planning process, as necessitated by the 73rd and 74th constitutional amendments," said the church body's Executive Secretary Fr Savio Fernandes. “Goa's identity which is reflected in its diverse and unique social and economic lifestyle of its village people is now being systematically destroyed by planning models being imposed by the Government by exploiting the archaic and obsolete laws like the Goa Town and Country Planning Act, 1974 for this purpose,” said Fr Savio. “The opposition to the inclusion of villages in PDAs and ODPs is over two decades old. The Government has not been serious in putting a contemporary, transparent and accountable planning structure and process in place. Recently, the Government urged the Village Panchayats to present their Village Development Plans to fulfil the criteria laid down by the Fourteenth Finance Commission for the release of financial grants,” CSJP said. CSJP also said that the State government is imposing the PDAs and preparing the Outline Development Plans for the same villages without consulting the Village Panchayats and without giving consideration to the Village Development Plans as approved by the Gram Sabhas. “The ODPs are being put in place without any scientific study being done to assess the carrying capacity of the area and its impact on the social, cultural and economic well-being of the villagers. Such unscientific, arbitrary and non-participatory approach in the planning process gives an impression that the inclusion of villages in PDAs and the ODPs is to promote mega infrastructural projects of real estate developers.” the church body said. Meanwhile, the Council appeals to the government to immediately scrap the PDAs and ODPs from the villages and to re-enact the out-dated Goa Town and Country Planning Act in order to incorporate the District Development Planning process as necessitated by the 73rd and 74th Constitutional Amendments. “The mere attempts of the government to falsely drag in the Archbishop's office to confuse and misguide the people will not help to resolve the crisis. In this regard, the Council appreciates the resolve of the villagers to protect their villages from unsustainable development.” CSJP added. However, CSJP also said that the State government’s authorities have not been serious in putting up a contemporary, transparent and an accountable planning structure and process in place.